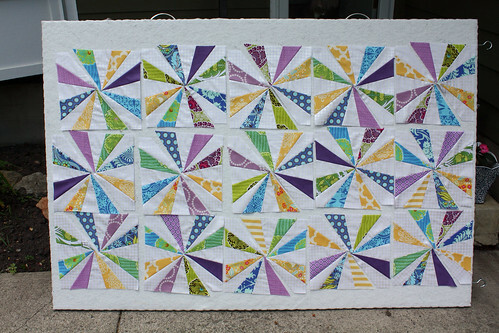 This past weekend I finished up the last of the 60 half blocks that I require for my kaleidoscope quilt top. Since it was pretty overcast and my sewing room was far, I dragged one of my design walls outside so you could have a peek in some natural light. Here are 30 of my half blocks, all lined up and waiting to be sewn together. Not exactly the pristine center seams that I had been hoping for. I tried out a few different pining methods and was able to pull off something a bit more presentable, but to be honest, I really struggled with this. I went to bed angry the other night and could NOT fall asleep. Have you struggled with center seams? Any great tips that I can try my hand at? I'm worried this WiP has me semi defeated and as a result it may hang on my design wall long after what I anticipated. To end on a much more positive note, I started making a new bag yesterday and I could not possibly be more excited about! I'll be sharing more details about it in my next post. And more importantly, you still have three days to enter our blogiversary giveaway to win a collection of some of our most favourite sewing treasures. Enter now and we'll post the winner this weekend *insert happy dance here*. This week I am linking up to WiP Wednesday over at Freshly Pieced. The blocks look beautiful Kelsey. Sorry they've been a source of stress for you though. It's hard, with blocks that have so many converging seams. I'm doing that with my orb quilt right now too but the difference is that it's all a neutral colour in the centre of my blocks so if they don't match perfectly it doesn't show. I don't think I've ever sewn anything with so many converging seams - I can imagine they are super tricky to get to line up! 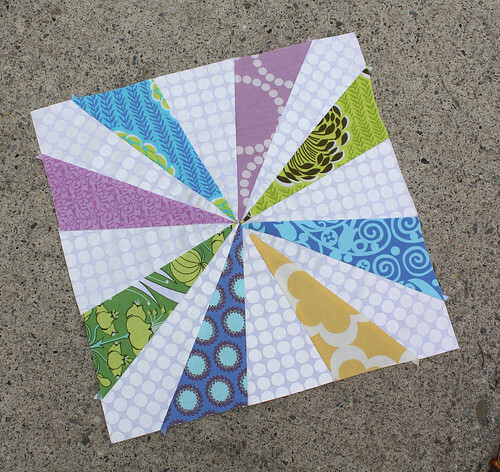 The second block looks pretty spot on, and would definitely look pretty much perfect after quilting. Could you consider something to hide that part of the block, like an appliqued circle (or other shape) in the centre? I've definitely seen that used as a technique to hide uncooperative seams. 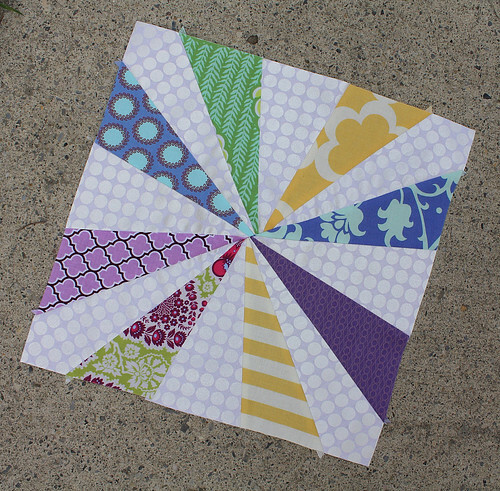 Your blocks are looking great though - I love the colour scheme - this is going to be one sparkly quilt! Can't wait to see your new bag too. My fingers and toes are crossed for your lovely giveaway. I don't really have any hot tips for you. I can imagine it's really frustrating, as I've had similar situations; BUT I do think the quilt will look absolutely stunning even if it's a headache. Your fiddled one looks great to me. Looking forward to seeing that bag in progress too! I wish I did have some tips for you but I've not tried a block with so many seams meeting like that. I totally get the frustration when things don't go quite according to plan but I'm sure you'll find a way round it. My best tip is to hand baste the tricky bits. Then sew s-l-o-w-l-y along the basting stitches. I like to use a non-matching thread and remove it.